We want successful civil proceedings to ensure a judicial record of the truth behind our loved ones’ murders. This would send an important message to terrorists everywhere that they will be brought to justice. Any compensation will be paid to a veterans’ charity. In February, Sarahjane Young, whose father Lance Corporal Jeffery Young was one of the murdered soldiers, issued a case against the Chief Suspect in the High Court with our support. Our legal team have confirmed where the Chief Suspect is living and have access to the evidence to bring him to trial - our barristers say our case is strong. Under the law, we have until August to serve proceedings. The Legal Aid Agency knows this but, after two years of negotiations, still hasn’t granted funding. They repeatedly block funding for our case on absurd grounds such as trying the Chief Suspect isn’t in the public interest. How can it not be in the public interest to bring suspected terrorists to trial? All the while, millions in legal aid has been spent trying to prosecute British veterans who fought to keep us safe from terrorism. What message are we sending to terrorists if we say - you can attack our cities, murder our troops, police and innocent civilians, and still be left to walk free and not answer for your crimes? Terrorists cannot be allowed to get away with murder. If we allow this to happen, we are only emboldening them to commit further atrocities. In the wake of the recent terrorist attacks, this case is obviously a matter of huge public importance. Our loved ones pledged their lives to this country. Yet one government after another has turned its back on them, and us. We have been made victims three times over. First by the bomb, then by Blair and now by the bureaucrats of the Legal Aid Agency. If we can’t fund this action now, the law says Sarahjane may be out of time to pursue the case and the Chief Suspect will have evaded justice yet again. We can’t let this happen. We are raising funds step-by-step and hope that, at some stage, the Legal Aid Agency will no longer be able to refuse us funding. The total cost of this case to its conclusion has been calculated by an independent cost draftsman as £640,000. Having already funded, prepared and issued a Claim form with the High Court, the action is now officially underway, but there are several additional legal stages we now have to fund. All the work is being carried out at legal rates and has been independently costed and determined to be necessary by a costs draftsman. We will release details on further stages as we progress. We hope you understand that, due to the nature of the case and the fact that the Chief Suspect is a convicted terrorist, this court case is more complicated than most. We are also prevented from giving too much detail here. As this is a public website, we can’t alert the Chief Suspect in advance to the precise nature of some of the actions we’re taking. 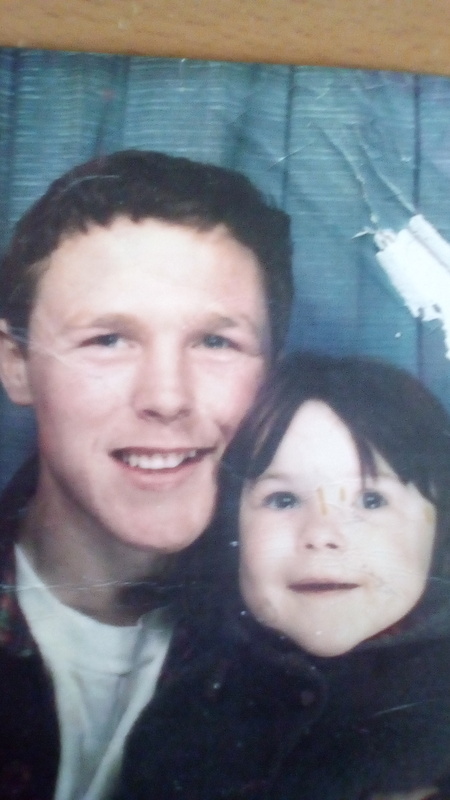 I am asking you to support Sarahjane – and all the victims’ families – to bring the man believed to have murdered Sarahjane’s father, my brother Simon and the other British soldiers to justice. Your support will allow our legal team to continue their work to bring the Chief Suspect to trial and finally to be held to account. We could not have come this far if it had not been for the hundreds of hours of work they have done us pro bono over the last few years, but they cannot bring this case to court without your help and proper funding. Your support means the world to me, Sarahjane and the other families who lost their loved ones in this atrocity. Thank you for your support. We are represented by McCue & Partners LLP, the UK's expert in counter-terror litigation, who have represented thousands of victims of terrorism worldwide in cases against the likes of the Real IRA, HAMAS and Muammar al-Gaddafi. The Firm represented the families of the victims of the 1998 bombing of Omagh by the Real IRA, in ground-breaking and successful civil proceedings against the bombers and the terrorist organisation itself. It was the first time that victims had brought a private prosecution against the terrorists when the state had failed or been unable to act. 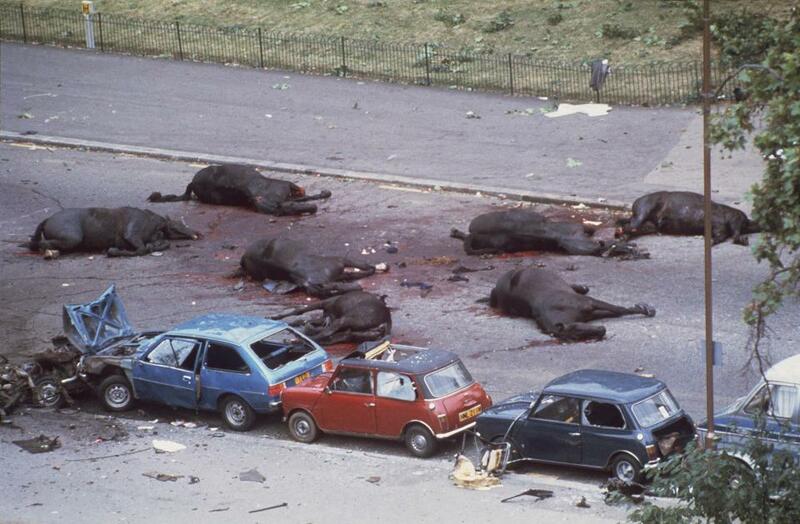 Today is also the 36th anniversary of the Hyde Park Bomb, which murdered four British soldiers and injured dozens more, including civilians. As you know, Sarah Jane Young, whose father, Lance Corporal Jeffrey Young, was one of the murdered soldiers, was finally granted legal aid to pursue her legal action against the chief suspect, John Downey, in February. Since then, the legal team has been busy making sure that the court process marches forward. Most recently, court rules have required us to attempt a settlement with Mr. Downey. We did so but he has not responded. As a consequence, we will now move forward to trial, which we hope will take place in Spring next year. Please remember to follow us on Twitter and on Facebook for more updates @HydeParkJustice. We've been granted legal aid! We are so pleased to be able to tell you that, after three-years of struggle, we have finally been granted legal aid to take this case forward. This case would not have survived without your kindness and generous support. We would never have made it this far without you. Thank you from the bottom of our hearts. We will, of course, keep you updated as things progress. We can now get on with the work of bringing this case to trial. You can read more about this milestone here. Yesterday we met our funding target of £85,000. Thank you to all those who have supported us these past few months. We couldn't have come this far without you. Your kindness and generosity have meant the world to us. Thanks to all your support, our legal team has been able to prepare our case and serve the necessary legal papers on Downey to commence our civil action. The papers have been sent and hand delivered to Downey’s properties. Additionally, we obtained a court order allowing us to serve Downey through an advert in the Irish Independent newspaper. Our legal team placed the advert last week, and the court order confirms that this also counts as notification of the case to Downey. He now has until the beginning of next month to respond our claim. This is a major milestone that we could not have achieved without your kindness and generosity. 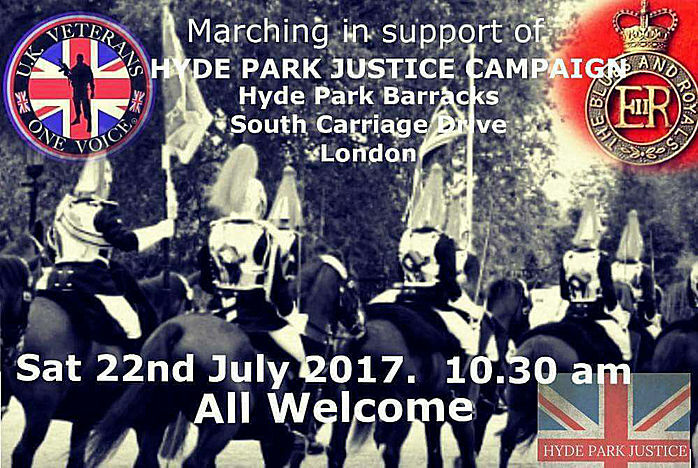 On Saturday, Veterans of our armed forces will be marching to support the Hyde Park Justice Campaign and to protest our treatment by the government. We have had an incredible few days. We can welcome 200 new supporters who have joined and donated to the campaign. Thank you so much! Just as incredibly, a number of our existing supporting supporters have donated for a second time. The result of this is that we have managed to raise almost £8,000 in 48h hours. There is still some way to go but this has been a massive boost and has given us hope that we will meet our next target. Meanwhile, our legal team is making progress on finishing its gathering of all the necessary evidence and taking next steps. Thank you so much again for all your continued support. It means the world to us and we could not be doing this without you. 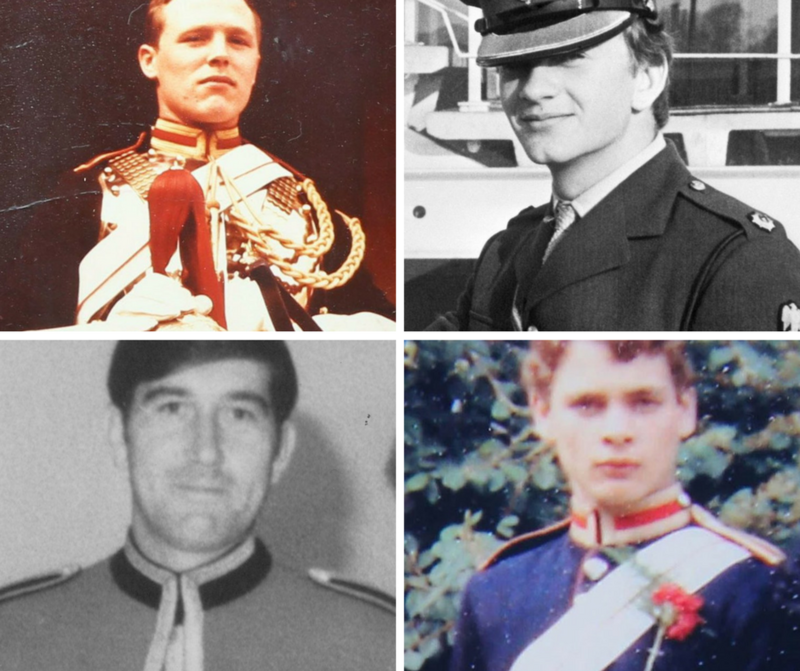 On Armed Forces Day, please help the families of four British soldiers murdered by terrorists bring the chief suspect to justice after a "catastrophic mistake" by the Government allowed him to walk free. We have been denied legal aid and the Prime Minister refuses to intervene. WE STILL NEED YOUR URGENT HELP. This afternoon we hit our first stretch target of £40,000. Thank you to everyone who has donated to help us get here! We could not have done this without your amazing generosity, and although there is a long road ahead, your support shows us that, even 35 years on from the devastating bombing, there is still hope for justice for our loved ones and to send a message to terrorists that, no matter where and how long you hide, justice will catch up with you! We and our legal team can now continue on the next step on the road to justice. We will be updating you on our progress soon. Please continue to spread the word and to donate what you can. Your support, as ever, means everything to us. Corbyn responds to open letter. Last month we wrote to Jeremy Corbyn as leader of Her Majesty's Opposition to ask if it would discharge its duty and challenge the Government on its failure to provide adequate support to the victims of the Hyde Park bombings. Yesterday morning Mark Tipper (brother to murdered Trooper Simon Tipper) published an open letter to Mr Corbyn challenging him on this issue. Subsequently, last night the Guardian reported Mr Corbyn wanted to meet with the families, however we have yet to hear from him directly. We will keep you updated on any new information. We are currently only £227 away from our target. Help us get over this final hurdle so we can begin the legal proceedings to get justice. please share and donate here. Any donation, no matter how small or great is massively appreciated! It's the start of a new week and we are only £412 away from getting the justice ball rolling. Thank you to all who have helped us get this far. Please do keep circulating our page and of course please donate what you can here. We are so close! Reaching the target will enable our legal team to officially kick start proceedings. It's out there, let's see if we can reach our goal before the bank holiday. We are so close to our magical number of £40,000. A massive thank you to all who have donated and we are only £1,375 short of meeting our target. We kindly ask you to help us with one last push to get over the line. Please do share our page with friends, family and colleagues. You can find us on Facebook where you can like or share our campaign. You can also give us a follow or re-tweet us on twitter. Thanks for your ongoing support, it means the world to us! We are thrilled to announce that thanks to the ongoing support for our campaign, we have been granted an extension of 30 days. We have refreshed the campaign with new information and new images. Please take a moment to review this. We have already raised over £36,000 from over 800 people and for this we are truly grateful. This is enough money to enable us to carry out the work of phase 1 and enter phase 2 of the work involved to bring the Chief Suspect in these terrorist murders to justice. You can read more about this in the new campaign information below. Please share our success so far and continue to support us over the next 30 days. We'll keep you updated every step of the way. Thank you again, HPJC. We have 24 hours left to reach our £40k stretch target. Tomorrow we will apply for an extension to the campaign to allow us to exceed our goal, but it's important to us that we reach our target in the meantime. It would mean the world to us if you would take a moment this evening to share the campaign and help us over the £40k line. Just a few days ago we were at 700 backers and thanks to the immense support from our crowd, we are now at over 800 backers. As well as hitting our next £40,000 target soon, we have a personal goal to reach 1000 supporters within this campaign. Please help us to get there today. We thank you very much for your continued support. The Sun featured our campaign again over the weekend, you can read the latest article via the link below. We are now a week away from the end of this campaign. We're asking you, our loyal supporters to please share our campaign today far and wide. If we reach enough people in the next few days, we have a chance to fund over our next £40,000 goal. If everyone shared the campaign with someone today who went on to pledge just £10, we would be well on our way. Since the total cost of this case will be over £600,000, every penny raised in the next week gets us off to a better start and means that we have more time before we need to fund raise for the next stage in the journey towards justice. Just a couple of days ago we reached 600 supporters and so we're delighted to have gained another 100 people in support of our campaign so quickly. We're now over 700 supporters strong and we feel confident we'll make it to at least 1000. Here's some recent press coverage for the campaign. Please keep sharing our stories and our campaign. Thank you for your continued support. Over 600 supporters and Press. Today we reached the milestone of 600 supporters. Thank you to everyone who has so far supported us. We're pleased to be over 70% of the way to our first stretch goal. Please continue to share our campaign and join us in the conversation over on our Facebook page too. https://www.facebook.com/HydeParkJustice/. Thank you to everyone who supported us towards our first goal of £25,000. We are now on our way to our first stretch goal of £40,000. Every penny of overfunding on this campaign makes a huge difference to us so please continue to share and donate. You can join us over on Facebook too where you can invite your friends to like our page and follow our journey. We can't do this without you, so thank you again. Wow! What a day it's been for our campaign. We're delighted to have reached 80% of of our initial goal of £25,000 in just 10 days. Thank you to all who have supported us so far. Remember, unless we reach this goal, we get nothing. To help us further, please follow us on Facebook, share our posts and invite your friends to our page. The larger we can make our community, the more our campaign will be viewed. https://www.facebook.com/HydeParkJustice/. Thanks for your continued support. Today we surpassed 400 pledges of support to our campaign. We want to say a big thank you for helping us to achieve this milestone. Remember, unless we hit our minimum target of £25,000 we don't receive any of the funding. We want to get at least another 400 pledges as quickly as possible, so please do continue to share our campaign far and wide. If you know of anywhere we can post the campaign to increase our audience, please let us know via our Facebook page @hydeparkjustice. (https://www.facebook.com/HydeParkJustice/). You can also receive important day by day updates on the campaign here, so please do like, follow, invite friends and share. Your continued support means the world to us. Thank you again. Yesterday we put out a call for help to reach £10,000 in donations and we did. Now, we're aiming to hit 50% by the end of the weekend. With your help we can do it. Please help us to reach our target by sharing this case far and wide. The more momentum we can get in the coming days, then more chance we have of hitting our target. Don't forget to follow us on Facebook and Twitter for more updates. We just wanted to say a big thank you to everyone who has supported this case so far. Every amount, big or small helps us to get closer to our goal of bringing the Chief Suspect for the murder of our loved ones to justice. Please help us to reach our target by sharing this case far and wide. 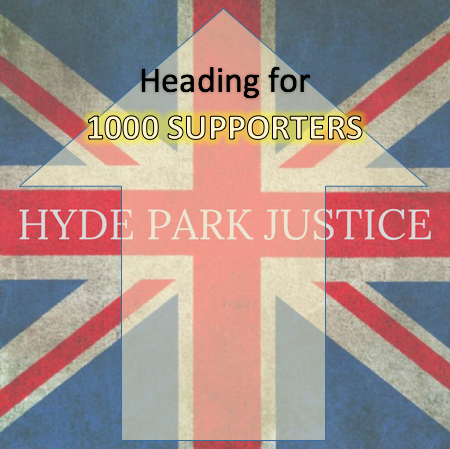 If you have any ideas for ways in which we can increase momentum, please get in touch at hydeparkjustice@gmail.com. The more momentum we can get in the coming days, the more chance we have of hitting our target. Yesterday, The Sun newspaper launched our campaign on its front-page. We can't thank the paper and its editors enough. Now the hard work begins. We've raised over £3,000 pounds on Crowdjustice in 24hrs, but we need to raise an awful lot more if we're going to hit our target. We're also grateful for the support of Danny Kinahan MP, who was the best man at Lt Anthony Daly's wedding. After Lt. Daly was murdered by the IRA, Danny commanded his burial party. As well as here, you can follow the Campaign on Twitter and Facebook for updates @HydeParkJustice.